I first posted this easy Bourbon & Spice Pumpkin Mousse recipe a few years ago as part of a Thanksgiving round-up, and thought I should share it again for those of you looking for a simple and no-fuss holiday recipe idea. This is kind of a cheater mousse--no eggs involved. Instead, you get lightness from freshly whipped cream that's folded into a sweet, fall-spiced pumpkin base. A few tablespoons of bourbon adds a special touch. This pumpkin pie cousin can be whipped up quickly and keeps well overnight. 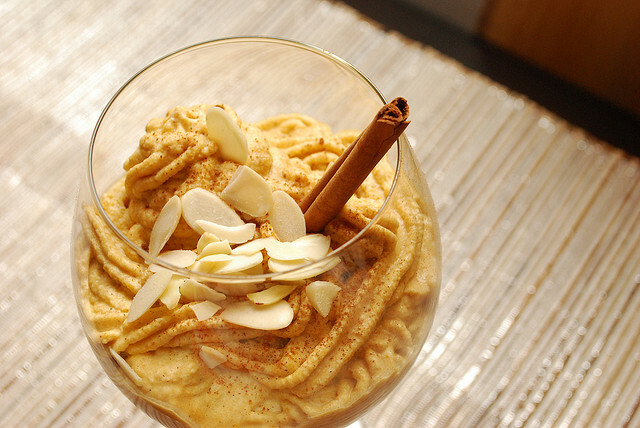 Serve in wine goblets or parfait glasses and garnish with toasted nuts and a cinnamon stick. In a medium size saucepan, combine the pumpkin, sugars, bourbon, vanilla, cinnamon, nutmeg, cardamom, and cloves. Cook for 2 minutes over medium heat until all the sugars are dissolved and the spices well incorporated. Remove from heat and pour into a large glass bowl. Place in the refrigerator for 30 minutes to chill. Once the pumpkin is cool, whip the three cups of heavy cream until medium peaks form. Gently fold in the whipped cream in batches until light, fluffy, and well combined. Pour into a serving dish and let chill for at least 2 hours before serving.